Description – Paneltech’s Alka-Max M is a high resin content specialty overlay composed of a bleached kraft paper saturated with high levels of a melamine resin. Its higher resin content gives a smooth, glossy surface well suited for maximum durability as a concrete forming surface. It gives a very smooth surface finish to concrete and will release easily from set concrete when used with the appropriate form release. Standard. Alka-Max M uses the same well-proven release system as Paneltech HDO, eliminating the residue buildup on press cauls typical of competitive products. 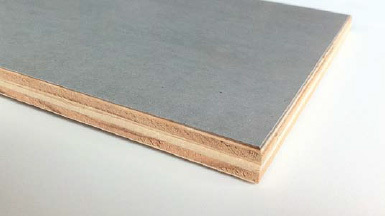 While the use of this product over suitable hardwood veneers is recommended, softwood veneers may be used with some reduced durability. Best results can be achieved using cauls or press surfaces free from scratches and dents, as these will transfer to the panel overlay.